We cruise through some of England's most beautiful countryside. A typical day would involve getting up, casting off, breakfast on the move, operating locks, steering the boat, preparing and cooking meals, mooring up, and dinner. In your spare time you can listen to music, chat to friends, catch up on sleep, continue discussions from last night's teaching session or just watch the world pass slowly by. 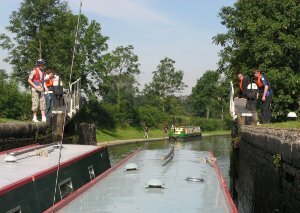 We stop regularly for ice-cream, locks, or to fill the water tanks. In the evening, there is an extended worship session with testimonies, talks and then a small group Bible study. In recent years, themes for the week have included a Bible overview, parts of Acts, parables, and the Lord's Prayer. After the studies we play games before going to bed. We have longer stops when the caterer replenishes the food stocks (it is amazing how much food gets eaten! ), which gives opportunities to play football and possibly other games, or have a boat race, with each boat making their own toy boat to race against each other. Previous years' boats have been powered by wind, balloons or fizzy Coke and mints! There will be an opportunity to go shopping or sightseeing in one of the towns we pass.